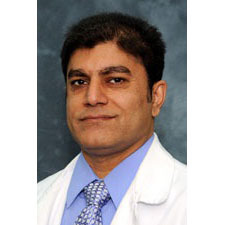 Masood Ahmed, M.D., an interventional cardiologist, has joined Augusta Health Cardiology. Dr. Ahmed will see patients in the Fishersville office on the Augusta Health campus through physician referral. Dr. Ahmed recently finished an interventional cardiology fellowship at the Tulane University Heart and Vascular Institute in New Orleans. He has also completed a cardiology fellowship at St. Luke’s Medical Center in Milwaukee. At Yale University School of Medicine, he did postdoctoral cardiology research and completed a nuclear cardiology fellowship. His internal medicine residency was done at Saint Barnabas Medical Center in New Jersey. Dr. Ahmed is board-certified in internal medicine, nuclear cardiology, echocardiography and cardiology. His expertise is in coronary and peripheral arterial disease interventions. Dr. Ahmed, his wife and two children have moved to Fishersville and are looking forward to their new life in the Shenandoah Valley.